In order to survive in life, we take on certain behavioural patterns and characteristics. These are known as archetypes, it’s important that we know when we are behaving as a particular archetype. As the famous Carolyn Myss would say “Don’t let your biology become your biography”. Life is tough and hard and we are all experience pain physically, mentally and emotionally. Shutting away emotion only causes blockages in the body, this is medically proven and can further surface as injury, illness and disease. Functional medicine is now showing the links in the body to emotion, feelings and experience. However, it’s knowing how to use the bad and negative experiences as an opportunity for growth and repair. All pain that we experience whether physical, mental or emotional will teach us something whether we like it or not. Do you ever feel like your life is drama or that a friend you have is living in a soap opera? This would be the victim archetype. It’s learning how to recognise this trait and pull yourself out of it. Whether we know it, or not, most of us react to life as victims. Whenever we refuse to take responsibility for ourselves, we are unconsciously choosing to react as a victim. This inevitably creates feelings of anger, fear, guilt or inadequacy and leaves us feeling betrayed, or taken advantage of by others. 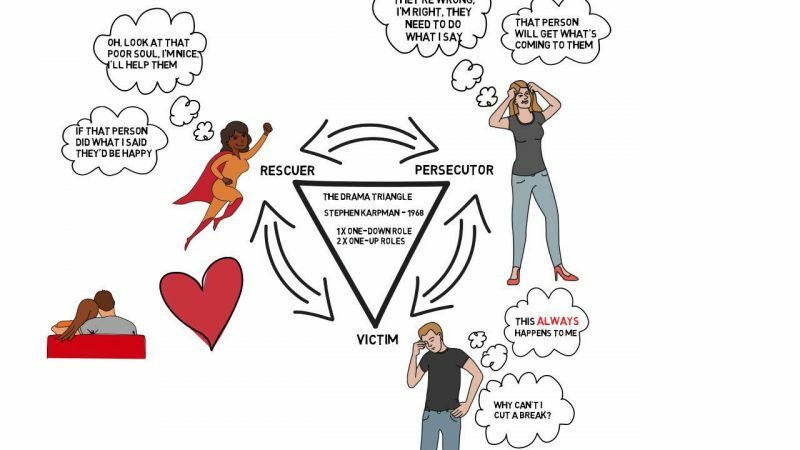 Victim-hood can be defined by the three positions beautifully outlined in a diagram developed by a well-respected psychiatrist, and teacher of Transactional Analysis named Stephen Karpman. 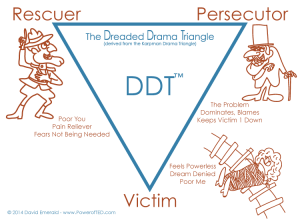 He calls it the “Drama Triangle,” I refer to it as the victim triangle. Having discovered this resource through Paul Chek, it has become one of the more important tools in my personal and professional life. 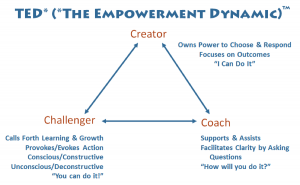 The more I teach and apply the victim triangle to relationship the deeper my appreciation grows for this simple, powerfully accurate instrument. I’ve sometimes referred to the victim triangle as a “shame generator” because through it we unconsciously re-enact painful life themes that create shame. This has the effect of reinforcing old, painful beliefs that keep us stuck in a limited version of reality. We sadly behave like this because the love mentors around us and this would usually people that we had growing including, parents, relatives friends and teachers also behaved as victims because the people who brought them up did the same. This is a confusion of love and the way we use unconditional love. I believe that every dysfunctional interaction, in a relationship with other or self, takes place on the victim triangle. But until we become conscious of these dynamics, we cannot transform them. And unless we transform them, we cannot move forward on our journey towards re-claiming emotional, mental and spiritual well-being. The three roles of the victim triangle are Persecutor, Rescuer and Victim. 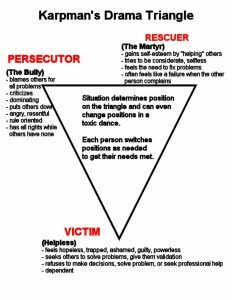 Karpman placed these three roles on an inverted triangle and described them as being the three aspects, or faces of the victim. No matter where we may start out on the triangle, the victim is where we end up, therefore no matter what role we’re in on the triangle, we’re in victimhood. If we’re on the triangle we’re living as victims, plain and simple! Want to know more or are stuck in a rut? Get in touch.